St. Ignatius of Antioch, Bishop, Martyr - My Catholic Life! Although not the most famous Saint Ignatius in the Church, today’s saint was the first to offer a theology of martyrdom. He also wrote seven famous letters en route to his ritual death in Rome, which set forth, with surprising vigor for so early a Christian, some fundamental Catholic beliefs. Saint Ignatius was a successor to Saint Peter as Bishop of Antioch in Syria. Antioch is an ancient ecclesiastical see where the followers of Christ were first called Christians. Bishop Ignatius was arrested in Antioch and, for unknown reasons, was transported across half of the empire to Rome for punishment. During this long trek, Ignatius wrote seven hastily composed letters to seven cities. He also visited with Saint Polycarp, who referenced Ignatius’ letters in a subsequent letter of his own. Ignatius’ letters, perhaps miraculously, have survived. They paint a vivid picture of first century Christianity and prove that what an educated bishop believed in 110 A.D. is essentially what Catholics believe today. Some suffering souls have experienced the passion of Christ in the very same manner that Christ did. Stigmatists have had bloody holes pierce their palms, felt the pressure of a crown of thorns on their skull, or the pain of an open wound in their side. Such re-livings of the passion show an advanced spirituality and detailed meditation on Christ’s final hours. The earliest Christian martyrs, such as today’s saint, speak more generally. They want to offer their entire lives as a holocaust or to be ground like wheat in the jaws of lions. They want to emulate the Son of God in emptying themselves in an ultimate witness. Only later saints endured physically parallel sufferings to those of Christ. The original martyrs were just open to dying. Period. Like Saints Polycarp and Maximilian Kolbe, Ignatius became what he celebrated, a living sacrifice offered to the Father. His body became the offering, a Roman amphitheater the church, the blood-soaked sand his marble floor, the spectators his congregation, and the cacophony of screams of bloodlust the sacred music that guided him in his last liturgical act, the gift of himself as he was torn apart by the powerful jaws of lions. Although Ignatius’ body was ripped to pieces, some few bones were picked out of the grains of sand and brought back to Antioch. They are now found in the Basilica of San Clemente in Rome. 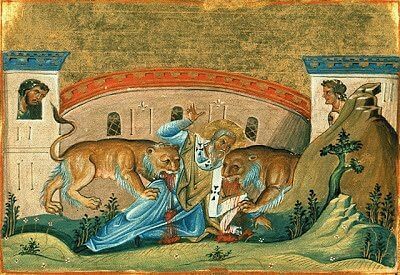 Saint Ignatius of Antioch, your courageous acceptance of your impending martyrdom was an inspiration to your fellow Christians then and remains an inspiration today. Give all who seek your intercession just a small portion of your steely courage in the face of real danger.